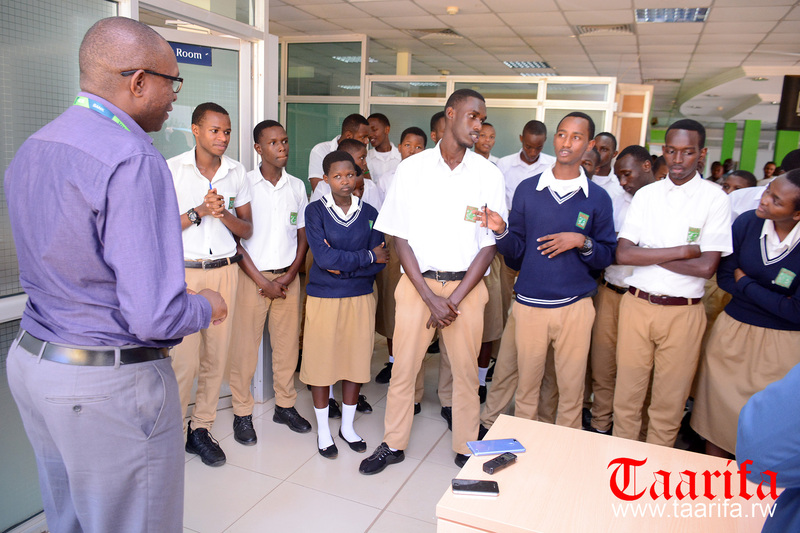 KCB Bank Rwanda today hosted 25 students from Lycee de Kigali secondary school, Nyarugenge district as part of this year’s theme “Money Matters Matter” The Global Money Week that ends on March 18, 2018. It is an initiative of Child & Youth Finance International (CYFI)- a global non-profit organization that works to reshape financial systems to economically and socially empower children and youth worldwide. George Odhiambo Managing Director of KCB Bank Rwanda said; “financial education has to start at an early age to facilitate a culture of saving, appreciation of the value of money and its impact on the quality of our lives”. Students were given a tour of the different units in the bank with explanations about technical aspects of each department. Topics of discussion ranged from types of accounts the bank offers, to different services in line with banking. Mr Odhiambo told students that “for whatever you want to become in life, long-term planning is an essential element of your journey. How you manage your time and money today will go a long way in helping you to achieve your dreams in the future”. He added that as bankers, they remain key stakeholders in driving financial literacy and inclusion. “We aim at achieving this through modern technology that simplifies usage of their products and services while frequently engaging segments like the youth to drive awareness,” he said. KCB has had several youth-focused initiatives to promote financial inclusion. The bank hosted a “Digital Day” event at the University of Rwanda- College of Business and Economics (UR-CBE) and at the Kigali Car Free Zone with over 100 students from different universities in Kigali to engage them on digital payment systems.